We’d love your help. Let us know what’s wrong with this preview of We never asked for Wings by Vanessa Diffenbaugh. To ask other readers questions about We never asked for Wings, please sign up. Maybe I missed something because I did search the book as much as I could. How could Letty have attended Mission Hills high school while living in the same apartment (Landing)? Confused because she sent Alex to a different high school (then lied about her address, and eventually relocated to a home in the actual Mission Hills district so he could attend the same high school as she did). Thanks in advance! I wish I could say I loved this as much as I loved Diffenbaugh's "Language of Flowers," but it was a letdown. Superficial and "lite;" with a chick-lit love triangle, one dimensional characters, and a fluffy plot that wants to be taken seriously, but doesn't quite have the emotional core or gravitas to pull it off. Just OK. Pleasant enough, but not memorable. Thanks to NetGalley and Ballantine Books for an advance reader copy of this book (my review is based on the hard cover version). Vanessa Diffenbaugh in her second novel , covers some tough issues and the story is quite a bit edgier than The Language of Flowers . She focuses here on the realities of teenage pregnancy , parental responsibility, illegal immigration and bullying. In keeping with her nature theme which was flowers and their meanings in her first book, this one is wrapped around birds and their flights with analogies to human behavior. In the past year I have read several books which focus in some way on questi Vanessa Diffenbaugh in her second novel , covers some tough issues and the story is quite a bit edgier than The Language of Flowers . She focuses here on the realities of teenage pregnancy , parental responsibility, illegal immigration and bullying. In keeping with her nature theme which was flowers and their meanings in her first book, this one is wrapped around birds and their flights with analogies to human behavior. In the past year I have read several books which focus in some way on questionable parenting and in each of those my stomach was in knots at various times in the book when I just couldn't stand how children were adversely impacted by mistakes their parents made . I felt the same in this story about some decisions that Letty Espinosa makes. I do believe in redemption and forgiveness but it wasn't easy for me to overlook Letty's negligence . I had questions from the beginning. Would Letty's children let her be their mother? Most importantly will Letty be able to take care of her children after all the years of not taking care of them ? Her parents who have raised her two children have returned to Mexico and Letty is forced to become the mother she has never been. I have to admit that a part of me felt for Letty even though she was not a mother to her children for years and I ultimately thought that she made a good decision in turning over the care of her children to her parents when as a teenager, she clearly was not equipped to do so. Diffenbaugh has done a tremendous job in exposing Letty's imperfect character . We know her thoughts and her doubts and her insecurities and her recognition of her mistakes and shortcomings but also know that she loves her children. My favorite character , was her fifteen year old son, Alex . He's smart , and kind and reflects what a great job his grandparents did but he's also conflicted about how he feels about his mother and wants to know his father . The inequities of the educational system, the brutal realities of bullying and the implications and effects on children caught in illegal immigration circumstances are brought to life in Alex's relationship with his girlfriend, Yesenia . Some may think that the ending was too neatly wrapped up but for me it was a fitting end since the journey there was not without consequences paid for mistakes , no matter how good intentions were . I definitely recommend this book and hope that Diffenbaugh continues to write stories that are raw and real and that speak to our desires for making our lives better . Sometimes a story just grabs you, either for the plot or for the characters. In this one it was some of both, I loved the characters, their flaws, their hope and dreams, their struggles, but I also loved the plot. Young love, trying to become a mother for Luna, after a very long time when she let her parents raise her two children, Alex fifteen and Letty six. Loved Luna, her exuberance, her determination and her fun personality. Some of her antics had me laughing. I loved this author previous no Sometimes a story just grabs you, either for the plot or for the characters. In this one it was some of both, I loved the characters, their flaws, their hope and dreams, their struggles, but I also loved the plot. Young love, trying to become a mother for Luna, after a very long time when she let her parents raise her two children, Alex fifteen and Letty six. Loved Luna, her exuberance, her determination and her fun personality. Some of her antics had me laughing. I loved this author previous novels but I feel that this novel is more tightly structured, that she has definitely matured as a writer. She writes with a light touch on some serious issues. The struggle for immigrants, especially undocumented ones to learn the language and to survive speaking very English. The constant fear of deportation. The bullying and struggles young people who are at all different or have physical challenges have in schools in so called less than ideal areas. Loved all the bird talk, Alex, his grandfather and the feathers. The tie that will forever bind the pair. A very good story that flows well. Curious to see what this author tackles next. correct their paths all at once". of birds in nature... and human beings. Letty, 33, has two children: Alex is 15. Luna is 6.
yard. Their building is old... falling apart. The grandparents are originally from Mexico. Although Letty was born in the US, the grandparents were undocumented. When Enrique goes to visit his sick mother - back in Mexico...(Orode Hidalgo), ... and doesn't return, Maria Elena goes looking for him. Worried he may have not been allowed back in the U.S. Yet, The grandparents don't return. her mother bring grandpa back. The problem is, Letty leaves the two children: 15 and 8 .....home alone - for days- which extend longer... their mother was in an accident on her way back home. This story could have gone in 'many' different directions at this point. The reader is on edge. Will Letty die and leave these two children an orphan? If she lives ... what type of mother will she be? Up until now... She has not been primary caretaker ever own children. still have a drivers license after having 2 DUI's. I admit... I had a hard time letting go of this thought... while reading this story. People do also....correcting past mistakes. There is an old saying though.... "I can forgive, but I won't forget"
And, Vanessa is a terrific storyteller. been faced with more stiff consequences. It actually made me angry. I understood the situation... yet... something just seemed off.... to let things go as they did. I felt a lack of integrity in parts of the storytelling. any book she writes in the future. I'm still a huge fan of Vanessa Diffenbaugh. that sincerely hurt. I live here in the Bay Area. I once lived in a getto area in Oakland at the age of 4,5 and 6... after my dad died. I remember being left home alone - at night - at age 5. It's just not an easy thing to forget. Yet... I recommend this novel. Makes for an excellent book club discussion!!! A woman that has a second chance to be mother to her two children, a young man in search of his birth father, a mother and daughter living under the shadow of immigration law enforcement. "We Never Asked for Wings" is everything a family centric fiction should be- emotional, a bit of romance, well written characters, fast moving plot and good writing. I am looking forward to reading "The Language of Flowers" in the near future. 2.5★ It was just okay, and then some. Disappointing as I really loved The Language of Flowers. The only character I liked was Alex but reading from his POV was too YA which is not my thing. Heck, most of the time it read like YA from Letty’s POV, and I’m just going to admit here that Luna annoyed me as well but that’s her mother’s fault. I kept finding other things to engage in while trying to read this and looking at other books coming up in my hold queues. Even drinking wine didn’t help. I had 2.5★ It was just okay, and then some. Disappointing as I really loved The Language of Flowers. The only character I liked was Alex but reading from his POV was too YA which is not my thing. Heck, most of the time it read like YA from Letty’s POV, and I’m just going to admit here that Luna annoyed me as well but that’s her mother’s fault. I kept finding other things to engage in while trying to read this and looking at other books coming up in my hold queues. Even drinking wine didn’t help. I had a glass earlier and was thinking maybe three stars but once it wore off so did my rating. I bumped it up because of the feathers and she is a good writer; just did not like this story. I’ve dropped out of the flock with my thoughts on this one I know. I can’t remember the last time I set aside an afternoon to finish reading a book. I switched off everything electronic and enjoyed every page of 'We Never Asked For Wings'. Letty, a 33-year-old mother of 15-year-old, Alex and six-year-old, Luna has left her children. She is followin I can’t remember the last time I set aside an afternoon to finish reading a book. I switched off everything electronic and enjoyed every page of 'We Never Asked For Wings'. Letty, a 33-year-old mother of 15-year-old, Alex and six-year-old, Luna has left her children. She is following her parents who have moved back to Mexico. She is terrified. Her mother has mothered Alex and Luna all their lives and Letty has never had to be a parent. When she returns to San Francisco alone, her son finds it hard to forgive her, and she has to find a way to forgive herself and make a new life for her little family. This is a beautifully-written, sometimes harrowing story dealing with the problems immigrant families face in America. The characters are unforgettable – including the ones we never actually meet – and so well-drawn that I believed I would recognise them if I met them in the street. Vanessa Diffenbaugh has found her niche in combining the stories of vulnerable people with the detailed intricacies of natural world. Flowers acted as messenger and metaphor in Diffenbaugh’s earlier work, while birds and their feathers keep the story aloft here. I enjoyed “The Language of Flowers” and was excited to read this book. 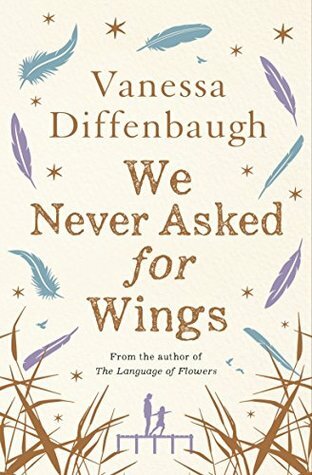 In “We Never Asked for Wings,” Diffenbaugh tells the story of a young woman who is forced by circumstance to finally be a mother to her teenaged son and young daughte Vanessa Diffenbaugh has found her niche in combining the stories of vulnerable people with the detailed intricacies of natural world. Flowers acted as messenger and metaphor in Diffenbaugh’s earlier work, while birds and their feathers keep the story aloft here. I enjoyed “The Language of Flowers” and was excited to read this book. In “We Never Asked for Wings,” Diffenbaugh tells the story of a young woman who is forced by circumstance to finally be a mother to her teenaged son and young daughter. What could have been a book with a completely predicable plot and robot-like characters is instead nuanced and topical. With her story Diffenbaugh requires her readers to ask themselves tough questions, particularly questions pertaining to undocumented Hispanics in the U.S. and public school funding. Thank you to NetGalley and Ballantine Books for a galley of this book in exchange for an honest review.
. . . the origin of our identity is love. One of the best things about book friends is sharing a great story. Sometimes, they get you to read a book that you hadn’t planned on reading immediately and sometimes you end up totally falling in love with that story. That's what happened for me, with this one. Letty broke my heart in the beginning. She was a horrible mother and just kept making one bad decision after another. It was hard to root for her and believe she would be able to pull it togethe . . . the origin of our identity is love. Letty broke my heart in the beginning. She was a horrible mother and just kept making one bad decision after another. It was hard to root for her and believe she would be able to pull it together for Alex and Luna, even when forced to. The screwdriver incident haunted me and was impossible to forget. As Letty grew as a mother, so did my feelings for her. Despite everything, Letty did what see needed to, to give her kids a good life. At first, I wanted things to end up a certain way, but the way things actually turned out was so much better. The ending was PERFECTION and so was Rick. This was a fabulous audio book. I do enjoy listening to lovely accents, and this lady knew her stuff. Spanish sounding and so authentic! This could possibly be a 4.5 star rating, but I am happy with leaving it at 5. I finished reading this a couple of weeks ago so unfortunately, this isn't a fresh review. A young, selfish and careless young mother that has left the real 'mothering' to her own mother, finds herself needing to learn quick smart how to care for her children. Unable to cook properly This was a fabulous audio book. I do enjoy listening to lovely accents, and this lady knew her stuff. Spanish sounding and so authentic! This could possibly be a 4.5 star rating, but I am happy with leaving it at 5. I finished reading this a couple of weeks ago so unfortunately, this isn't a fresh review. A young, selfish and careless young mother that has left the real 'mothering' to her own mother, finds herself needing to learn quick smart how to care for her children. Unable to cook properly or perform any decent mothering skills, her world is turned upside down overnight. Poverty and illegal immigrants are a harsh reality, and I think this story was authentic, sensitive and real. A scene that was quite harsh was one where a toddler drinks some bright coloured liquid mistaking it for cool aid - it was battery acid - my heart was thumping. What a fantastic story! I don't know how I missed this one when it was published but it is a great story and relevant to our times. Struggling Mexican immigrants trying to find a place in our society, raising their children as best they can, sometimes being able to carve out a new life, sometimes not. I listened to this as an audiobook and the voices came through loud and clear, the fear, the love, the wanting and needing to do the best for themselves and their families. This book is all about fa What a fantastic story! I don't know how I missed this one when it was published but it is a great story and relevant to our times. Struggling Mexican immigrants trying to find a place in our society, raising their children as best they can, sometimes being able to carve out a new life, sometimes not. I listened to this as an audiobook and the voices came through loud and clear, the fear, the love, the wanting and needing to do the best for themselves and their families. This book is all about family and loves lost and found. It also shows how strong relationships with grandparents and other family members besides just the parents can do so much to enrich and reward our children's lives. Vanessa Diffenbaugh's debut novel, The Language of Flowers, was an impressive debut that captured my heart. We Never Asked For Wings is a similarly poignant and touching story. We Never Asked for Wings is a story of redemption as Letty Epinosa picks up the mantle of motherhood when her parents decide to move back to Mexico. After years of benign neglect, she has to learn what it means to be a parent who is emotionally present in her children's lives while providing for them as best she can. Letty makes a lot of mistakes as she negotiates her new responsibilities but slowly she begins to find her feet, wanting the best life that she can possibly provide for her fifteen year old son, Alex, and her six year old daughter, Luna. Meanwhile Alex is falling in love for the first time and Letty is terrified he will repeat her mistakes, sabotaging his dreams with a teenage pregnancy. Alex however is far more responsible than his mother gives him credit for, but in trying to help Ysenia, an undocumented immigrant, escape the bullying she experiences at school, he unwittingly puts both their futures in jeopardy. We Never Asked For Wings explores social issues including single parenthood, educational inequality, poverty and immigration, and themes such as family, love, regrets and redemption. Birds and feathers are symbols of migration, patterns, hopes and dreams. 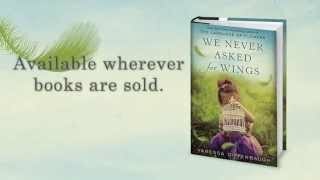 Sensitively and beautifully written, Diffenbaugh paints a vivid picture of a family struggling to overcome adversity and forge a stronger, united future in We Never Asked For Wings. This is a wonderfully engaging and affecting novel that tugs at the heartstrings. Only in this story, it’s Grandma and Grandpa who are suddenly gone. They decide to go back to Mexico, and leave their grandchildren to be raised You know the story, you’ve seen the movie, read the book. I was disappointed in the book. I know it is difficult to follow a wonderfully received novel like The Language of Flowers and the author even admits that in the Afterword but I expected more. It just didn't have the heart and soul that I wanted. Letty is a young mother of teen-ager, Alex, and 6 year old, Luna. She has left the child raising to her parents, illegal immigrants from Mexico. Letty works in dead end jobs and has quite a drinking problem. The grandparents suddenly decide to return t I was disappointed in the book. I know it is difficult to follow a wonderfully received novel like The Language of Flowers and the author even admits that in the Afterword but I expected more. It just didn't have the heart and soul that I wanted. Letty is a young mother of teen-ager, Alex, and 6 year old, Luna. She has left the child raising to her parents, illegal immigrants from Mexico. Letty works in dead end jobs and has quite a drinking problem. The grandparents suddenly decide to return to Mexico and Letty freaks out. She abandons her children and follows them to Mexico. Her parents turn away and she is forced to be a parent. Then we get the story of a woman who has turned her life around. Step by step she learns to be a better parent. She quits drinking and starts studying to earn more money. She finds a better place to live, supervises her children and meets not one man but two. Still, the kids shop for clothes in the alley behind Goodwill. Money is still tight. Her son falls for a girl who is here illegally and has physical deformities that make her a target for bullies. Life is still hard. As I started to read the opening scenes and chapters, I was thinking -- who are these crazy people and why are they doing these outrageous things? But the voice and style of "The Language of Flowers" resonated through the paragraphs as I kept reading, hoping to get to the turning point. Finally, it came and the real story began. This story of family, relationships, and trust also illustrates some of the current hot button social issues we are seeing in today's headlines. It's a very interesting p As I started to read the opening scenes and chapters, I was thinking -- who are these crazy people and why are they doing these outrageous things? But the voice and style of "The Language of Flowers" resonated through the paragraphs as I kept reading, hoping to get to the turning point. Finally, it came and the real story began. This story of family, relationships, and trust also illustrates some of the current hot button social issues we are seeing in today's headlines. It's a very interesting portrayal of ideas and putting a face on them. (I thought Letty's relationship with alcohol was very interesting and how it changes through the course of the story.) The author also raises the questions of what it means to grow up and what it means to take responsibility. The use of feathers throughout the story is wonderful; they reflect different stages of the action and transform as the story progresses. The ending is positive but not overly rosey -- there are still issues that will need to be resolved -- but importantly, the adults are making decisions with their children's best interests in mind. This book proves that you definitely cannot judge a book by it's cover. I loved Vanessa Diffenbaugh's The Language of Flowers and I expected to have many of the same feelings for this book AND it has such a beautiful cover! However, I was sorely disappointed. From the first pages with the descriptions of the bird feathers and the art I felt myself drifting away from the story. I immediately didn't like Letty, the main character and mother to Alex and Luna. In the opening of the book she leaves h This book proves that you definitely cannot judge a book by it's cover. I loved Vanessa Diffenbaugh's The Language of Flowers and I expected to have many of the same feelings for this book AND it has such a beautiful cover! However, I was sorely disappointed. From the first pages with the descriptions of the bird feathers and the art I felt myself drifting away from the story. I immediately didn't like Letty, the main character and mother to Alex and Luna. In the opening of the book she leaves her teen son and young daughter home alone to follow her mother who has returned to Mexico in search of Letty's father, both illegal immigrants, who has gone back to care for his own ailing mother. My first impression of Letty was "What kind of mother leaves her kids home alone with no money or food? No one knew Alex and Luna were alone and anything can happen to them! They are only kids!" My question was quickly answered. Letty is that kind of mom. Pregnant as a teen, unable and unwilling to take care of the baby, her mother steps in and cares for her child while Letty takes multiple jobs to earn money for the household and then spends her spare time partying like she hasn't a care in the world. Then to top it off she has another child that she adds to the mix of her uncared for children. Letty doesn't want her mother to go to Mexico because of selfish reasons...she won't have anyone to care for her kids and now, for the first time in her life she will have to be responsible and Letty doesn't think she can do it alone. I really loved Vanessa Diffenbaugh's earlier novel, The Language of Flowers so I was so happy to see that she was coming out with a new novel! This one comes out on August 18th and I definitely recommend that you pick this one up! This is a very different novel from her previous novel. We Never Asked for Wings focuses on motherhood, family, immigration and the American dream. I found it to be a really fascinating look at these things and it grabbed me right away. Diffenbaugh is definitely a great I really loved Vanessa Diffenbaugh's earlier novel, The Language of Flowers so I was so happy to see that she was coming out with a new novel! This one comes out on August 18th and I definitely recommend that you pick this one up! This is a very different novel from her previous novel. We Never Asked for Wings focuses on motherhood, family, immigration and the American dream. I found it to be a really fascinating look at these things and it grabbed me right away. Diffenbaugh is definitely a great storyteller. The characters in this novel were so well drawn that they felt very real to me - flawed, multi-faceted and realistic. I loved the exploration of illegal immigration through realistic characters - how being illegal 'feels' came alive for me. It gave me a more 'inside' view of that situation and ultimately helped me understand facets of it that I wouldn't have understood fully otherwise. I think the book really excelled at exploring what illegal immigrant families face every day. The other major exploration of this novel is around family, particularly motherhood. The main character of the novel is a woman who has never really had to mother her children as she let her parents take the parenting lead. When they are no longer there to do so, she must figure out how to do the right thing and step up. The exploration of both her desperation and her love for her children were interesting. I found it difficult to be OK with some of her really bad decisions as a parent but it was interesting to see her work those things out throughout the novel. All in all, I think it was a great exploration of motherhood and redemption. I also thought that this novel does a great job of exploring poverty and how poverty impacts so many aspects of ones life - education, transportation, access to information, and just day to day ease of life. The juxtaposition of the haves and the have nots is very evident in this novel. Diffenbaugh really takes her readers through the ins and outs of poverty in this novel which is another thing that I really liked about it. My only frustration with the novel was the ending. Although it was fine, it felt a bit too easy for me. It just wrapped up so perfectly that it was almost too perfect. I wish it had felt more realistic to me. But, the story until then was fantastic so I can let the ending be just a small issue for me. All in all, I really enjoyed this novel. Not quite as much as her first novel but I think this is a solid follow up! There is so much in this novel that will make the reader think and look at the world differently! For that alone, I think this novel is worth the read! Highly recommend! Her character driven novels center around flawed characters like Letty Espinoza who must learn to care for her children after years of disengagement. Poverty and immigration and second chances are themes that run through the novel, yet the author never preaches. Letty's children Alex(15) and Luna (6) worked their way into my heart--as well as Yesenia, Alex's girlfriend. I thought each character was a delightful addition to the whole. I "forgot" to cook dinner one night because I wanted to see how this book wrapped up. "Migrating birds reorient themselves at sunset. The exact reason is unknown, but at twilight, just when the sun drops beyond the horizon line, birds flying in the wrong direction correct their paths all at once." Makes me wish I were a bird. 2 years ago, I read The Language of Flowers by Vanessa Diffenbaugh and I loved it. I was thrilled to receive an ARC of Diffenbaugh's second book, We Never Asked for Wings. I was not disappointed. I love this author's style! She has the ability to make you fall in love wi 4.25 stars! I love this author's style! She has the ability to make you fall in love with the flawed and quirky characters she creates. The writing is beautiful! The pacing is perfectly done to allow time for the characters to creep inside your heart, and make you want to blow off whatever you had planned for the day just to live in their world and cheer them on- which is exactly what I did today. In this novel, the author touches on subjects such as parenting, family, first-love, poverty and illegal immigration. While a lot to tackle in one novel, I found it to be very well done. This would be an excellent book club selection as there is much to discuss. I would definitely recommend this book if you are looking for a thoughtful read that tugs at your heartstrings. I liked the story. I liked the characters. I liked the background immigration issues, but it wasn't as good as The Language of Flowers. It seemed a little too easy and Letty could have been more complex. I also didn't love that she needed men to step into the rescue -- it felt too romance for me. Good not great. This is a beautiful story of young love. I enjoyed the book and did not want to put it down. When Letty Espinoza took off in her car to stop her mother from going to Mexico, she had left behind her two children, alone in the apartment. Hers had truly been an act of desperation. She had given birth to her fifteen-year-old son Alex when she was just a teenager, and her mother, Maria Elena, had taken over the responsibility of raising him. Letty worked three jobs to support the family, and when she had her second child, Luna, now six, she had hoped to try again to be a parent. But it was to When Letty Espinoza took off in her car to stop her mother from going to Mexico, she had left behind her two children, alone in the apartment. Hers had truly been an act of desperation. She had given birth to her fifteen-year-old son Alex when she was just a teenager, and her mother, Maria Elena, had taken over the responsibility of raising him. Letty worked three jobs to support the family, and when she had her second child, Luna, now six, she had hoped to try again to be a parent. But it was too easy to allow Maria Elena to continue in this role, and Letty felt incapable of the task. Would she now be forced to try her wings as a parent? Before she could move ahead, though, there would be a final plea in Mexico, and then she would head home. But an accident along the way would derail her plan. How would Letty finally learn to step up as a parent? How could she make up for her virtual abandonment for the past fifteen years? And how would Alex's father Wes change her plans for the future? Obstacles arise with Alex and his new girlfriend, who has complex issues that none of them could foresee. Changing schools to improve Alex's chances for a better future might be just what he needs, but could it also lead to a gigantic misstep that would leave all of them floundering? In reading the acknowledgements, it was revealed that author Vanessa Diffenbaugh had great difficulty writing this, her second book. Could she match the success of her first, The Language of Flowers? She spent arduous hours writing and researching, almost giving up on this novel that deals with some tough issues. Her hard work paid off. It is a heartrending story of desperation, hope, love and resilience. Vanessa exposes the prejudices of poor Hispanic families who are struggling to make a better In reading the acknowledgements, it was revealed that author Vanessa Diffenbaugh had great difficulty writing this, her second book. Could she match the success of her first, The Language of Flowers? She spent arduous hours writing and researching, almost giving up on this novel that deals with some tough issues. Her hard work paid off. It is a heartrending story of desperation, hope, love and resilience. It would be hard to follow up such an incredible book like The Language of Flowers and I think this was a valiant effort, although it might be missing some of that charm of the author's first book. This book is beautiful in its own way though and it reminded me a lot of, "The Same Sky," as it tackles the issue of illegal immigration and two sweet kids neglected by their alcoholic mother, struggling with poverty a I received an ARC from NetGalley in exchange for my honest thoughts & opinions. Questo libro mi aveva incuriosito molto sia per la trama sia per le bellissime copertine, infatti la Garzanti ne ha create ben 4, ognuna con un ciondolo diverso a cui è attribuito un significato particolare e a me è capitata la farfalla ovvero libertà. Le ali della vita parla dell'amore in tutte le sue forme: amore tra madre e figli, il primo amore adolescenziale e l'amore che il protagonista prova per la scienza e gli uccelli. Il libro è diviso in 4 parti che descrivono il cammino verso la maturità sia di Letty sia di Alex, una crescita interiore e la scoperta dell'amore familiare e non solo. Letty e Alex crescono insieme pagina dopo pagina, ma lo fanno "camminando" fianco a fianco ed ognuno affrontando a suo modo i propri problemi: Letty si ritrova improvvisamente sola con i suoi figli, deve imparare a fare la mamma e anche se all'inizio tutto sembra difficile piano piano cambia, matura e finalmente riesce a farsi coinvolgere dai figli, amandoli e proteggendoli. Alex scopre l'amore, sia verso la sua famiglia sia verso la sua compagna Yesenia, una ragazzina con un difetto fisico che lui cerca di proteggere da tutti e infine scopre anche l'amore per la scienza e per gli uccelli, che suo nonno gli ha insegnato a riconoscere anno dopo anno. Una storia emozionante, che inizia lentamente e appassiona fin dalle prime pagine: nella prima parte vengono introdotti i personaggi principali, la loro storia per nulla facile e come inizieranno questa "nuova" vita di famiglia. Letty e Alex sono i personaggi meglio caratterizzati attorno ai quali ruotano altri personaggi, ciascuno con una propria storia e con un ruolo ben preciso nelle vite di Letty e Alex, ognuno li aiuterà nella loro crescita interiore e ad affrontare i problemi. Vanessa Diffenbaugh ha la grande capacità di riuscire a render reali i suoi protagonisti: come Luna, la sorellina di Alex, ha solo 6 anni e l'autrice riesce benissimo a render l'idea di come vive giorno per giorno una bimba così piccola, di come sia facile diventar capricciosa, annoiarsi e affezionarsi con facilità alle persone. L'autrice non ha semplicemente creato dei personaggi, ma li ha resi vivi, mettendo in evidenza le caratteristiche tipiche della loro età e descrivendo con precisione come vivono e affrontano i problemi. Ho trovato bellissime le descrizioni che l'autrice fa dei luoghi in cui vivono i protagonisti ed emozionante anche il modo in cui Alex parla degli uccelli, delle loro piume e tutti i ricordi a cui sono legati. Durante tutta la lettura non c'è un solo istante in cui il lettore non venga travolto dalle emozioni dei protagonisti, è un crescendo di è un crescendo di sentimenti che si insinuano nel lettore piano piano, attraverso le pagine stampate arrivandogli dritte al cuore. Lo stile è semplice, colloquiale e la lettura, mai noiosa, scorre velocemente e difficilmente si riesce a prendere una pausa, continuando a pensare a come andrà a finire la storia di Alex e Letty anche quando non si ha il libro tra le mani. Le ali della vita è si una storia d'amore, ma anche una finestra su un mondo che non sempre si ha modo di conoscere e tratta argomenti davvero molto delicati come l'immigrazione, il bullismo, le gravidanze inaspettate ad un'età in cui si dovrebbe ancora pensare a giocare e mette anche a confronto mondi diversi, mostrandone pregi e difetti. It must be a daunting task to follow on from the success of a first novel like The Language of Flowers (which I adored beyond words.) Blood, sweat and tears were obviously poured into this story, you can feel it. Wings may not have quite the same charm as flowers but it's quirky with Diffenbaugh's trademark beautiful prose and take, on timely social issues. I couldn't put it down. When Letty's undocumented parents abruptly return to Mexico, 33 year old Letty Espinosa finally steps up to 'mother' her 15 year old son Alex, and 6 year old Luna, a precocious child who would have even the Mother-Theresa-of-mothers, tearing her hair out. The story alternates between Letty's perspective and Alex's. I cared about all the characters. The burden of responsibility on Alex's young shoulders made my heart ache. Letty isn't an easy character to like, she's hardened with a long history of poor choices and when those poor choices involved her children, I really didn't think I'd connect with her. But Diffenbaugh writes flawed characters with truth and compassion ... I was drawn in, I began to understand and empathise rather than judge. And then I cheered as she chose a new path and made changes. I liked the parallel between migrating birds and people correcting mistakes and their paths. And I loved the science and memory in feathers (who'd have thought) ... being a little cryptic here as you just have to read this yourself. We Never Asked For Wings highlights not only the struggles for undocumented immigrants but the differences between the haves and the have-nots, poverty, education and housing opportunities, bullying. But, it also illustrates the innate goodness of people, the kind of goodness that restores your faith and ignites that little spark of hope. It's a story about family and choices and finding your true place. Mistakes don't have to define you. Choosing a new path takes courage but brings hope for a different future.